I love the natural beauty of stained wood. I like the richness of the texture of the grain when it is highlighted buy the color of the stain. The photo above shows a wood parquet floor I installed in the downstairs living room of my Brooklyn house. I like it when all the mouldings, trim , and flooring are all made from stained wood. To me this looks very classy. Of course it is get harder and harder to find one piece mouldings without imperfections because of the increased demand for lumber which is resulting from the rise of the economies of China and India. You can get what is called finger-jointed moulding, which is made of pieces of real wood glued together, but it does not look good when stained. More recently new wood substitutes have come to market made from recycled plastics. Some of samples of mouldings and banisters I have seen look very good and have a realistic wood grain texture throughout the pieces. 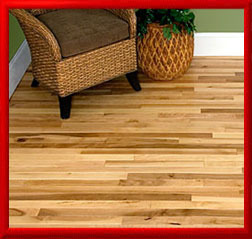 For flooring the wood needs to have a very high surface hardness. I do not know if any of the synthetic woods have this characteristic yet.